Archive "Shot Fake Basketball Shooting Drills"
All of these shot fake basketball shooting drills come with both HD video and written instructions. Every video has an expert coach or trainer instructing the drill, and a high level player demonstrating the different moves within the drill. This allows for better understanding of the drill, and how to do the different moves correctly. A shot fake is something that every player should learn to use, but this is especially true for shooters. Once a player has made a couple of shots, the defense is going to fly at them. This opens up the opportunity for a shot fake. After the shot fake though, the player must now know what to do with the basketball in order to capitalize. These basketball drills are going to help work on selling the shot fake, and then making the correct move after the shot fake. Being able to correctly shot fake, and then take advantage of it, adds so much value to an offense. If you have an entire team that is able to master this skill, the defense will be in trouble. These shot fake basketball drills are going to help your team develop and master the shot fake move. Details are a big part of the shot fake. It is important that the player’s shot fake looks exactly like their shot, but with a stopping point right above the forehead. It is up to you as the coach to make sure that you are correctly coaching the shot fake. A great shot fake can add so much value to your game as a player. It allows you to exploit the defender’s over aggressiveness, and opens up easy shots for yourself, or a teammate. To be a great shot faker though; you must pay attention to details, and learn to sell your shot fake. So really make sure that you spend the needed time at the beginning learning the correct movement of the skill. 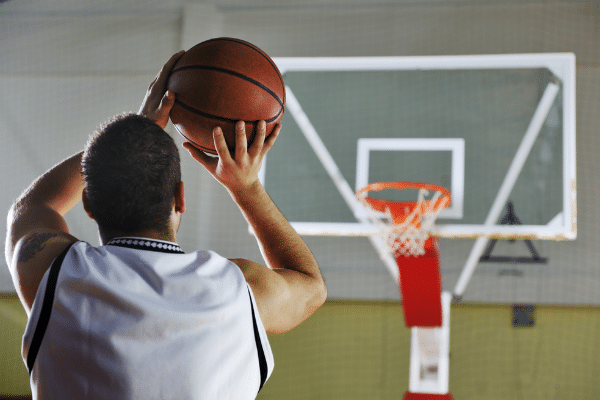 To view these shot fake shooting drills you must be a Pro Member. If you are not yet a Pro Member we would like to invite you to sign up today and get a Free 7 day Pro Membership Trial. This will give you full access to everything that we offer on the site. This shot fake basketball drill will help you work on the mechanics of doing the move and will also work on your footwork. This basketball footwork drill is going to work on coming into your shot and practicing your shot fake. Footwork is key when shooting the basketball. 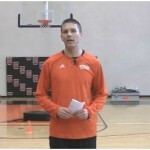 The video is instructed by Mercer University's assistant basketball coach Doug Esleeck, and will explain the basketball footwork drill, and then one of his players will demonstrate how to do it. The backpedal shot fake 1 dribble pull up basketball shooting drill will help you to work on your footwork, shot form, and also your conditioning. This basketball shooting drill is designed to help you work on your shot fake one dribble pull up shot but also develop your mental toughness by putting added pressure on the shooter to hit shots. The shot fake 1 dribble pull up on the move partner basketball shooting drill is great for working on selling your shot fake and then getting right into your shot off of the dribble. This basketball shooting drill allows you to get a lot of reps at shot fake one dribble pull up shot in a short period of time. The freeze fake shot allows the defender to fly by and then opens up a shot or can be used to draw a foul on the defender that has left their feet. This drill is going to work on the shot fake 1 dribble pull up. It is going to teach the shooter to set their feet, sell their shot fake, and make shots. The star basketball shooting drill with a shot fake 1 dribble pull up will allow you to work on this move and get a lot of reps in a short period of time. 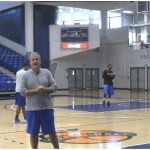 For this basketball shooting drill you are going to work on coming into the shot fake with the proper footwork and selling the move as well. . This 3 point shooting drill is going allow the player to get a lot of repetitions at the shot fake side step 3 point shot and also help to work on the player conditioning. The shot fake 1 dribble freeze fake shot is a more advanced type of shot, so it will take a lot of repetitions to master it. This shooting drill will help.